Cases on Telecommunications and Networking presents a wide range of the most current issues related to the planning, design, maintenance, and management of telecommunications and networking technologies and applications in organizations. Real-life cases included in this publication clearly illustrate challenges and solutions associated with the effective utilization and management of telecommunications and networking technologies in modern organizations worldwide. 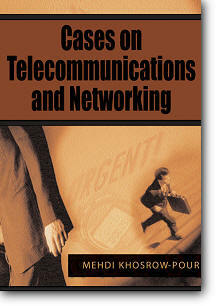 Cases on Telecommunications and Networking provides practitioners, educators, and students with important examples of successes and failures in telecommunications and networking systems implementation. This publication is instrumental for those learning about the issues and challenges in the field of telecommunications and networking systems.